An awning window is unique in that it is hinged at the top and opens outward, preventing rain or falling leaves from entering your home. Featuring a single pane, awning windows are also great basement windows due to the ease with which they allow for ventilation. 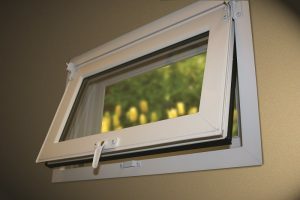 If your home is located in the Louisville, Kentucky, area and you are interested in having awning windows installed, look no further than the experienced window pros at Compozit Home Systems. We’ve been providing replacement window installation and other home improvement services since we first opened our doors in 1982, and we’re proud to have more than 140,000 satisfied customers to date. We are committed to staying at the forefront of the replacement window industry, and that has helped us earn an A+ rating with the Better Business Bureau. As a pioneer in the composite window industry, we offer locally manufactured awning windows that outperform those offered by the competition. Our Compozit series windows are made from expanded polymer composites that offer greater durability and energy efficiency than wood, vinyl, or fiberglass windows. For the more cost conscious homeowner, we offer our C2 SERIES windows, which are manufactured from Compozit-clad vinyl and offer many of the same benefits. All of our windows feature triple-pane glass with low-E coatings, gas fills, and other features that have helped them earn ENERGY STAR® certification. Contact Compozit Home Systems today to ensure that the awning windows installed on your Louisville-area home provide the level of performance you’re hoping for. Be sure to ask about the financing options we offer.